After a market absence of 12 years, Ethiopian Airlines is planning to resume service to the New York area by the end of June. Ethiopian Airlines suspended its service to Newark Liberty International Airport in 2004 in order to offer non-stop service between Washington Dulles International Airport and Addis Ababa, offering connections to its network in East, Central and Southern Africa. However, by the end of June Ethiopian expects once again to provide a link between New York and Africa, by launching a new one-stop service linking Addis Ababa with New York JFK via an intermediate stop in both directions at Lomé. Lomé, the capital of West African nation Togo, is the home base for Ethiopian Airline’s partner ASky Airlines. “New York is one of the world’s most economically powerful cities and including it in our ever-expanding network will play a critical role in the expansion of trade, tourism and investment between the fast growing continent of Africa and the United States,” adds GebreMariam. Ethiopian Airlines’ flights from Addis Ababa to New York JFK will depart on Tuesday, Thursday and Sunday mornings, returning from JFK to Addis Ababa on the same evenings to touch down at Lomé and Addis Ababa the following day. According to the airline, the new flight will offer passengers from New York faster flight itineraries to a variety of cities, as result of better connecting times and routings. Ethiopian expects to offer New York flight connectivity beyond Addis Ababa to and from major economic and tourist destinations in East, Southern and Central Africa and the Middle East, including Nairobi, Entebbe, Dar es Salaam, Kigali, Khartoum, Jeddah, and Riyadh. Meanwhile, via Lomé, Ethiopian’s partner ASky Airlines will offer connectivity between New York and many cities in West Africa, including Lagos, Abidjan, Dakar, Libreville, Douala, N’djamena, Kinshasa, Bamako, Conakry, Ouagadougou, and Niamey. 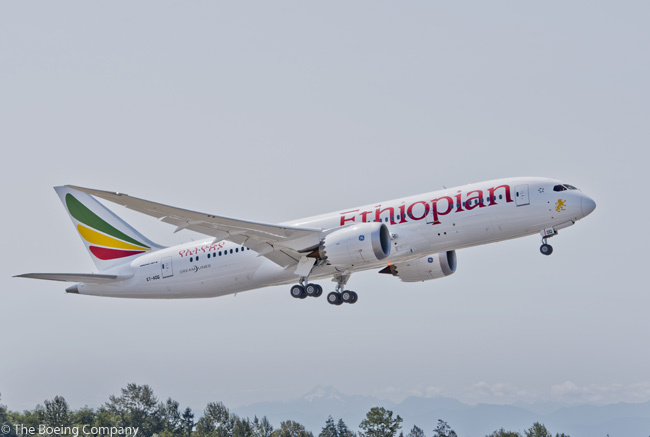 Ethiopian will operate Boeing 787-8s on its Addis Ababa-Lomé-New York JFK round-trips. Each Ethiopian Airlines 787-8 is configured with 24 business class seats and 246 economy seats, all of which are equipped with on-demand video monitors featuring a variety of entertainment options.